Nattalie McClelland, of "Nailed It!" nail salon in Brazil, creates Halloween inspired candy corn painted acrylic fingernails on Times' reporter Ivy Jacobs, after helping Jacobs stop biting her fingernails. Nail biters and cuticle pickers are everywhere, yet social stigma connected to it keeps many hiding their hands in their pockets. Including me. Let’s face it, it’s a stressful world in which we live in. I’m surprised to find people who don’t bite their nails or tear at their cuticles like ravaged dogs. For years I’ve chewed on my fingernails. Sure, people laughed, me too, but inside I hated myself for doing it. I’d try all the remedies to stop, no matter how silly or expensive, to only fail in the end. Psychologists and medical researchers don’t know the motivation for nail biting, but most agree it probably is a result of stress, a learned behavior, acquired bad habit or maybe a result of poor grooming. I actually lean a bit toward the latter, but with a twist. See I was doing the proper grooming, but I discovered my biting occurred when something got under my fingernails. It drove me nuts when that happened, and I’d gnaw at my nails to clean under them. Gross, right? But once I started to clean out from under my nails daily, sometimes more according to what I was doing, my nails started to grow out. The problems were just beginning, because the fingernails I had were very thin and tore right off like paper. A little while later in life I had a health condition to deal with and the medicine for it dried out my hands as well as my cuticles, which began to tear off in large chunks. Nothing like stubby nails and chunks of flesh ripped off your fingers to show the world how put together you are (NOT!). I considered purchasing those long silk black gloves to hide my hands inside, but I knew that would draw even more attention to my hands. Thought I was doomed to have ugly hands, until I made friends with a woman from Reelsville on Facebook. With the support of her husband David, Nattalie McClelland was going to Jocie’s Beauty School in Brazil to become a manicurist when we first met, after graduation she started her own business called “Nailed It!” That’s the nail salon on State Road 59, the last shop in the Crowder Lawn and Garden strip mall plaza on the east side, just south of the Marathon gas station at Billeville Road. I went in there with my daughter Olivia, who was having acrylic nails applied for the first time. It was at my daughter’s urging that I ask about having the nails applied to my hands. My nails and cuticles were in BAD shape, having acrylic nails applied that day wasn’t going to happen. I knew having fancy fingernails weren’t ever going to happen, but Nattalie was optimistic. As she cleaned and prepped my nails for gel polish application, we talked about how, with proper nail hygiene, I could have fingernails again. It took five weeks, but she applied acrylic nails to my fingers last Friday. My nails are strong enough now, thanks to Nattalie, the hope is within another month or two I won’t need acrylics anymore. Then it was the Indiana State Board of Cosmetology and Barber Examiners written exam, which covers 15 subjects, and afterward she had to start the application process for nail technician license. The journey was worth every moment to Nattalie. 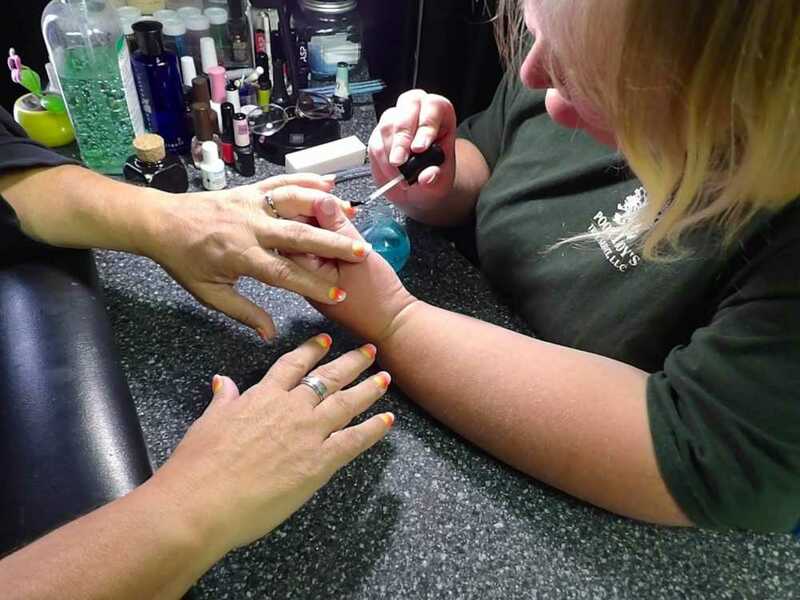 The industry is also stable according to the Indiana Workforce Occupational Projections, which estimates a growth rate of 16.4 percent in the number of nail technician jobs through 2020. When Nattalie finished painting my nails — which are inspired by Halloween since it’s just around the corner — we both were smiling. Promise you Nattalie, although they look like awesome little pieces of candy corn, I won’t be biting them anymore. Apparently, getting a nail stuck in a metal door and having it rip off a few days later was something I was going to do. Nattalie got me right in the next day. And it was. She even checked the others and put another top coat on a couple of my nails that were dulling due to wear and tear. She guarantees her work, and happily repairs booboos with a smile. That is a true treasure in the business world of today. Nattalie is always up for creative challenges. She’s going to be creating newsprint design for my nails in the future, and I’m excited. My husband is a bit perplexed about my being “girly” all of a sudden, but it’s exciting to have fingernails after a lifetime without them. It’s a fashion accessary I didn’t know that I wanted, but I’m enjoying them now. You can find Nattalie McClelland and check out her work on the salon page "Nailed It! "on Facebook for more information or set up an appointment if you are or want to be a reformed nail biter.